The Beachcomber - St. Tropez is for those who enjoy the outdoors and like to be out in it. It's a lightweight, portable beach mat that you can take anywhere. Fully-padded with adjustable reclining backrest, the Beachcomber - St. Tropez allows you to stretch out your legs over a durable polyester mat sparing you from messy sand or bug-infested grass. It also features an adjustable shoulder strap and a zippered pocket, large enough to hold magazines and personal effects such as a wallet or shirt. Its steel frame means the Beachcomber - St. Tropez is built to last. You won't be disappointed with this beach mat. 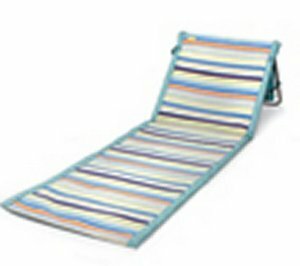 Makes an excellent gift for anyone who loves to stretch out at the beach or park!